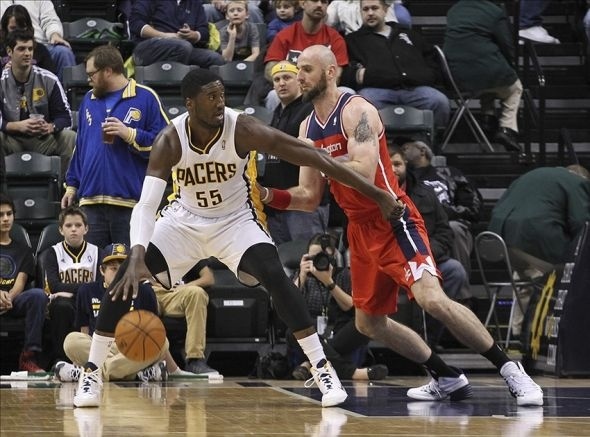 The Indiana Pacers & the Washington Wizards enter their Eastern Conference Semifinals match-up in remarkably different fashion. The Pacers were considered the toast of the league during the all-star break then it all went downhill. Despite the regular season collapse the Pacers still managed the #1 seed and their 1st round matchup with the Atlanta Hawks was going to be a cake walk….Not so fast… The (38-44) Hawks pushed the Pacers to Game 7. The Hawks took advantage of several match-up advantages…..Jeff Teague exposed George Hill. The Wizards was considered a good team , but the biggest knock on them was their lack of playoff experience coupled with a young backcourt. The Wizards simply demolished the Chicago Bulls in their 1st round match-up in 5 games. Wall and Beal proved their critics as the nearly averaged 20 PPG a piece in their series vs Chicago. In a series like this generally the best player is the deciding factor & Paul George fits that bill. George flexed his muscle in Game 7 vs the Hawks pouring in a career playoff high 30 points and 11 rebounds….expect him to have several nights like this! The Wizards Win if: John Wall completely dominate his matchup against George Hill & have a Jeff Teague-esque series coupled with Trevor Ariza ability to neutralize Paul George. The Pacers Win if: Roy Hibbert comes back to All-Star form (the classic big man that is missing in today’s game) & Paul George must take over offensively night end night out!